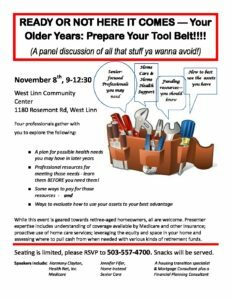 Ready or not Here it Comes— Your Older Years: Prepare Your Tool Belt!  Professional resources for meeting those needs – learn them BEFORE you need them! While this event is geared towards retiree-aged homeowners, all are welcome. Presenter expertise includes understanding of coverage available by Medicare and other insurance; proactive use of home care services; leveraging the equity and space in your home and assessing where to pull cash from when needed with various kinds of retirement funds. Seating is limited, please RSVP to 503-557-4700. Snacks will be served. Featuring Harmony Clayton, Jennifer Fifer, A housing transition specialist Health Net, Inc Home Instead & Mortgage Consultant plus a Medicare Senior Care Financial Planning Consultant.